The April 2014 issue of English Magazine Reader’s Digest (India Edition) is before time and we are really happy for the same. Here are our reviews for the same. 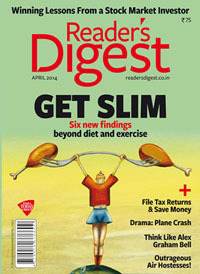 Usually we expect to find money and investment related article(s) in April issues of magazine like Reader’s Digest. However as due to elections approaching in India, the interim budget was passed and people are waiting for the main budget for the next government. So there seems to be less information about investment and money planning in this issue. However there are some investment planning tips which are true in all cases and aspects. We find an article titled Winning lessons from a stock market investor focusing on the same. Mohan Sivananad’s editorial is thoughtful as in most cases. This time he talks about people’s obsession to be thin and considering it to be healthy. This is dangerous and so does the attitude of considering being weighty as healthy! His introduction to financial articles is also good to read. We often read or hear the cases of the technically not so clever officials of armed forces. We also here how technically smart thieves or other shady characters outplayed them. Even the cases of the officials have old technology gadgets, vehicles and even outdated arms are common to hear (especially in India). A few incidents showing the smart use of technology by police/officials to catch the shady characters (taken from New York Times) mentioned in this issue are good to read. They re-assure us that the people who had given the responsibility to guard various segment of society are well equipped (by all means) for the same. There is a page dedicated to the history of lunchbox, which is interesting read. Up-Close : section brings and interview with Geraldine Chaplin, the daughter of famous comedian actor Charlie Chaplin. The interview is titled as Aging Gracefully. The interview is however shorter. As stated in many of my previous reviews of Reader’s Digest (and even in other articles as well); Kindness Of Strangers is my favorite segment in the magazine. It is about real human values which make us human beings in true manner. It reinforces our faith in humanity and makes us to believe that the society is still a good place to live in. And these generous fellows are responsible to make the society the better place. Three incidents mentioned this month makes us to believe that you can help anybody if you have heart. Those who hunt for knowledge and information will find an article titled Who invented Toothbrush? very interesting. The article also shows the photograph of the toothbrush used by French emperor Napoleon Bonaparte! A movie starring Russell Crowe about Noah released recently and we see a humor article titled If Noah Lived Today. It is kind of satirical look at some of the current situations and formalities. My Story – segment have the story which makes you to remember the song of Hindi film Border, Mere dushman, mere bhai,…. Dale Zelko, was an F-117 stealth fighter pilot (in 1999). He was on a mission to bomb his targets, and so do the opponents. His aircraft was intelligently shot by through anti-aircraft weapon by an opponent. And after few years they are good friend! Do you believe it? Believe it or not, it is a real story beyond the imagination in normal circumstances. It is not only good to read; but also explores the human attributes very interestingly. There in article showing some ways to be or stay slim. I like a couple of points which are practical one should implement, others are quite superficial and may be needed to be taken care of those who do not do any work at all, or diagnosed with obesity. The open editorial is about Air India’s cabin staff and the airline’s loss in last couple of years. S. Rajan brings an article about investing in stock market. He starts it with two totally different use cases. The article can prove a good read for those who want to invest in the stock market. Actually, in India, the situation is, those who invest in the stock market, invests a lot, and those who keep themselves away from the market, doesn’t even go for a really good and genuine offer. The others who invest wisely and moderately are in minority. My personal advise is, it is better to play safe and invest it by knowing various factors and studying some important aspects of the scheme and the company. Remember there is no short-cut to be rich overnight. So rather then going for some fantastic and abstract goals tempting you, be grounded and book the profit in a way that some degradation in rate doesn’t harm your portfolio and your economic situation remain balanced. An interesting article is there which is focused on – Filing Tax Return. The writer analyzed it correct that a lot of people avoid filing return by thinking as the tax is deducted by the employer, there is no need to file your return. It is not the case. You can surely file for NIL tax return, but you must file. There are various reasons and aspects shown in the article, makes it worth reading. Young fellows (who are just out in the field by finishing their study) and senior citizens (who mainly live on pension or dependent of their children) needs to read it more carefully. Apart from the -real life drama – article; an article titled – Nature knows it best, is a good read. The tag-line of the article (which is fact) attracted me to the article the most, which is: When it comes to brilliant new technology, we have a lot to learn from animals. It is a not to miss article. An article about Yangon (aka Rangoon) will interest history lovers and travelers the most. And while reading the article you will definitely remember the famous Hindi song from old days More piya gaye Rangoon, kiya hai wahan se telephoon….. A nice article. It also gives the detail about accommodation, food, shopping,… there; which is good. Robert Andrew Powell’s short story is a good choice for thriller lovers. If you are running on shortage of time and have time to read only a few articles of this magazine – Calling on youth – article is the one you should go for. Now a days we are so keen to be clean. Drink only filtered mineral water, eat only so and so kind of food. Be closed in home of office during so much heat, cold or rain! These are good habits but anything done beyond certain limit is definitely something wrong. We keep away our children to play on the ground and dust and make them victim of so many allergies later, for example. 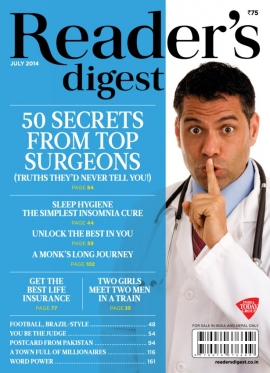 The article – Good bacteria, good health – is a good reading material. Jokes that harm, Jokes that hill – is one more article which is good for time pass. There are other articles and regular sections as well. In my opinion, the magazine issue is worth to go for. It returns you for both the time and money you spent to purchase it. What you think about this issue? Are you going to read it? What are your thoughts about this article? Do you found it helpful to you in making decision to purchase it? Do share your thoughts via comments below, we love to read you. Also if you found the article useful, please share it via various social networks with your friends and family members.